This course explores animation as an artistic tool. Students will approach animation as a medium of time and movement, investigating the ways in which the formal elements of temporality operate within the structural framework of image-making and narrative. Students will explore their ideas through stop-motion animation by utilizing traditional art materials as well as found objects. Students will also learn how to create cell animation through a rotoscoping technique. The class offers introductory tutorials on Adobe Premiere Pro for editing animation footage. Contemporary Art Issues introduces students to current visual art practices and concepts. The class primarily consists of guest artist lectures, visits to galleries, and digital presentations. In this course students will be asked to discuss and write about issues in art. They will also be introduced to questions that explore exhibition criteria, the market, site specificity, the hierarchy of materials and methods, art’s role in contemporary society, and who determines art’s value; ultimately, the students are asked to define for themselves what is meaningful artwork. Creative Writing workshops are taught with the visual thinker in mind. Students approach writing from a creative point of view learning to express themselves through poetry, word games, objects, existing text, and journals. Students also visit current exhibitions at major art museums and galleries to enhance their written works. A poetry reading, and publication of student work concludes the course. Digital Photography is an introductory course designed to explore what it means to take pictures. Classes will consist of shooting, printmaking, critique, and collective discussion. Students will gain the basic technical skills needed to photograph using DSLR cameras and to make digital prints. Each student will be encouraged to think critically about what subjects hold meaning for them and what unique perspective they can bring through composition, lighting, and the language of photography. Class discussions will center on a diversity of artists’ practices, the histories of photography, and questions regarding the politics of representation. Introduction to Drawing is designed to explore drawing as the fundamental language for all art forms through observation of still life, interiors, exteriors and the figure. 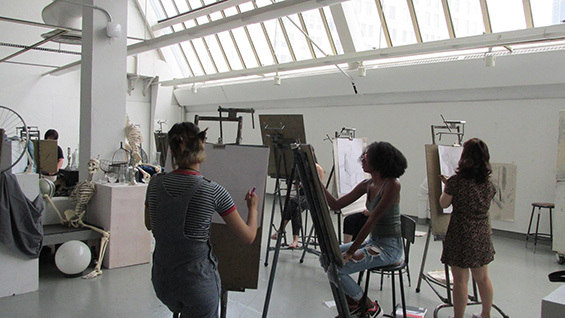 Using a variety of mark-making and mark-subtracting tools, color media, and large-scale formats, students learn to bridge drawing’s basic elements to form compositional, individual statements. Through discussion and critique, students discover the vocabulary by which to talk about drawing and express their ideas visually. Class work is complemented by sketchbook exercises, and guest artist critiques. Graphic Design is taught as an art medium and form of communication. Students are introduced to a variety of two-dimensional design concepts and an introduction to letterforms (basic typography). Drawing, collage, digital photography and computer programs (such as Adobe InDesign and Illustrator) are used to execute the class assignments.